Solve the math mystery by doing multiplications and divisions. Games to work with products and quotients. Free printable worksheets to practice the times tables. Fun math worksheets to learn math operations for free. Pastimes and activities for 4th to 6th graders. 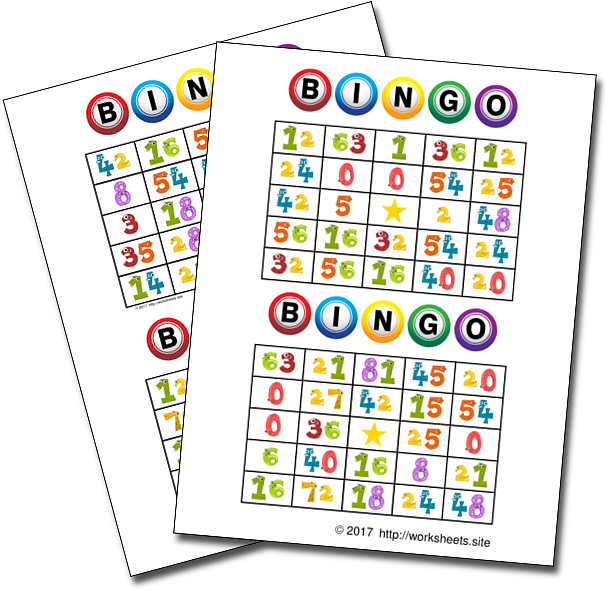 How to practice multiplications in a fun way? 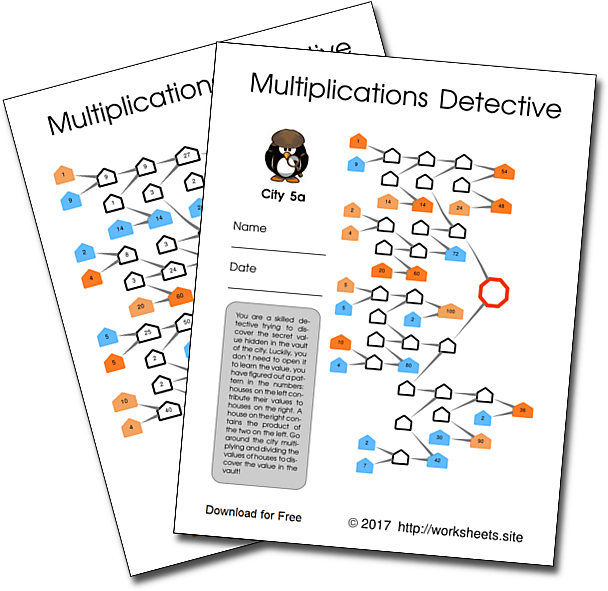 For this worksheets, you are a skilled detective trying to discover the secret value hidden in the vault of the city. Luckily, you don't need to open it to learn the value, you have figured out a pattern in the numbers: houses on the left contribute their values to houses on the right. A house on the right contains the multiplication of the two on the left. Go around the city multiplying and dividing the values of houses to discover the value in the vault! The file has 10 city puzzles, the child should find the houses for which he or she can easily calculate the value and go from there until the vault is reached and its value found. Sometimes the student will need to calculate a value by multiplying, others by dividing. The numbers go for 1 to 100. Each worksheets requires between 30 and 50 calculations. The document contains 10 pages, Pages a and b share the same hidden result, but the distribution of houses and values are different. So if pages a and b are given to different children, they can check each other results by comparing them, as a game. This allows them to play and learn on their own, without the need for an adult to review operations. If calculations differ then at least one student is wrong, students should recheck their work. The cards are in PDF format. Use the password worksheets.site to open the PDF file. This is a pencil and paper activity that does not require any cutting or gluing. These worksheets are ideal for homework. They are a fun alternative to regular homework and parents can help their children along, however children can guide and self-correct themselves by checking whether the secret number found makes sense or not. It is very popular with children and parents. You can hand identical sheets out to every student in the class and do a speed race, with prizes, for students who discover the secret number first. The game is a perfect activity for those children who finish their work early and are left with nothing to do. It can be printed and kept in a game box or on a shelf where children can access it when they finish their work. These printable games are a great activity that students can use to help others. Pair a slower student with a faster student so that students can teach each other. An activity that is really worthwhile is that some children learn the game and then teach others. Teaching others how to play is a great communication activity.